Left: Firedrake members meet at Chatham Historical Dock Yard. Right: HMS Cavalier. Second row: Brompton Barracks Church. Centre: The Lines Memorial. Right: The Buffet by the Wrens Association. Last row: Firedrake's badge in the window. Centre: Viewing the book of remembrance. Right: St George's Chapel. 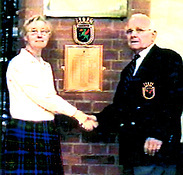 Plaque for St George's. On 9th September myself and Bert How were back at St George's Chapel, Chatham Maritime barracks, to meet Margaret Kershaw again, to place a plaque with all the names of those who were lost with the Firedrake on the night of 16-17th December 1942. The photos below are of that event. On my travels as the secretary of the Firedrake association, I have visited many towns and places all over the UK, keeping in touch with the members, and just going to places that my uncle had been to as a rating in the Royal Navy in WWII, in the last three years I have seen many memorials to those who were not able to see the final victory and to enjoy the peace which was their goal, there are memorials in almost every town in UK, so here are just a few for you to ponder. 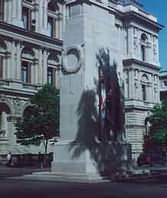 The Cenotaph in White Hall London. 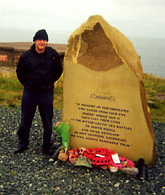 The Memorial to the crews lost on Russian Convoys, at Cove on Loch Ewe Scotland. 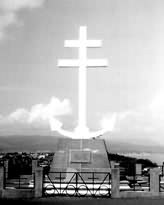 The Memorial to the French lost with the Maillé Brézé at Gourock on the Clyde Scotland. The War Memorial in the Diamond Londonderry Northern Ireland. 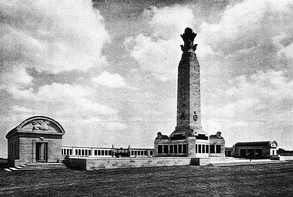 The Memorial at Chatham for all those lost from that Naval base in two world wars. The memorial at Lisahally on Lough Foyle to all those who died in the battle of the Atlantic. And a big thank you to Harry Dougan who very kindly let me stay at his house and drove me to all the beautiful sites in Northern Ireland. The Union Jack Club Honours The Firedrake. 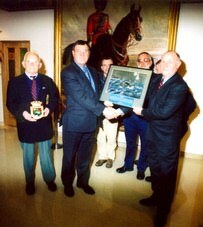 On the 15th March 2002, a small group of HMS Firedrake association members made a presentation of the ships badge and a copy of the painting to the Manager of the Union Jack Club in London. The ships badge will hang it the Entrance Hall surrounded by lots of other badges from all three services, the painting with a plaque with information of what happened on the 17/12/42 will hang in the bar. Attending the presentation were left to right: Bert How who served on the Firedrake holding the ships badge, Terry the manager of the Club holding the painting, Behind the painting is Keith Bennett, who's father Wiggy served onboard and is featured on page 10, then Stuart Clayton from the Flower Class association, and just visible peeping over the top and between Stuart and myself is Phil Bennett brother of Keith, and then holding the painting and shacking hands with Terry, is the Artist and founder of the association myself. Sadly in August Terry the manager of the Union Jack Club suffered a massive heart attack of which he did not survive, on behalf of the members of the Association please can I pass on our condolence’s to Terry's wife and family. R.I.P. Terry Dove B.E.M. Ex Leading Telegraphist and producer of the Navy Video Time Capsules. Crossed the bar suddenly 15th March 2002. Roland's uncle had also served in the Firedrake. 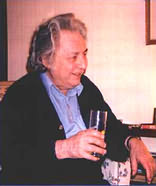 Roland was a great comfort to me and easy to talk to when I was having problems with this web-site, and the gathering of information for it. Roland had helped me find some film of the Firedrake and Fame, being launched back in 1934, they were featured in a news real at the time, I've managed to track the film down in the ITN films archives but the cost of the copy rights is to much for the association at the moment, I'm hoping to include it in the future, with some sound. I was hoping that Roland and Margaret would have been able to attend the reunion this year. On behalf of the members of the Association please can I pass on our condolence’s to Margaret and her family. Also in August we sadly lost Reg Fergusson who had joined the Navy as a boy at 16, and became a member of the Firedrake's crew before the war started in September 1939, a veteran of the sinking of U-39, Narvik, the Battle of Spartivento and service with Force H in the Mediterranean, Atlantic, Malta and Icelandic convoys, he contributed an article to the web-site which is on page 10, he served with the Firedrake right through until December 1942, then after upgrading he was drafted to another destroyer, after the war he stayed in the Navy, finishing his time out in South Africa in the 60's. In the last few years, Reg had not had the best of health but it still comes as a shock when we lose some one, my thoughts and condolences go to Beryl his wife and son and daughter. Rear Admiral Terence Ridley CB, OBE. Engineering officer whose skill enabled the Firedrake to limp back to Gibraltar. Terence Ridley’s remarkable intellect manifested itself early in his naval career when he won the Robert Roxburgh prize for academic achievement at Dartmouth naval college in 1932. He specialised in marine engineering, taking his degree at the engineering college at Keyham in Plymouth. After qualifying, his first sea duty was as an engine room watch officer in the cruiser Exeter and the battleship Valiant. At the outbreak of war in 1939, Ridley was appointed to the Firedrake as the engineering officer. In July 1941 when Firedrake was severely damaged by the Italian 500kilo Bomb on operation "Substance" Ridley was responsible for repairs to the hull and propulsion machinery, enabling the ship to make a long nerve-racking limp back to Gibraltar. For this and previous service he was twice mentioned in dispatches. He was appointed OBE in 1954. And in 1957 he was promoted to captain and appointed a founder member of the Dreadnought project team under the Engineer-in-Chief’s department in the Admiralty. 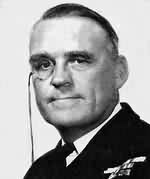 In 1962 he took command of the engineering college at Manadon in Plymouth, this is when he started to wear a monocle. When a graduating class turned out on parade all wearing monocles, he tossed his into the air and caught it in his eye, and said try that then. He was appointed Port Admiral Rosyth in 1966. He was appointed CB in 1968 and retired in 1972. Rear Admiral Terence Ridley CB, OBE. Died on 25th December 2001 aged 86. Joined the Firedrake as junior officer in 1937, when she was patrolling the Spanish coast during the Spanish civil war, when she went to rescue of the British freighter Cervantes, under attack by a German Heinkel bomber. This was one of the first occasions when an aerial torpedo was launched against a ship. He served as gunnery control officer on the battle ship Duke of York during operation 'Torch' the landings in North Africa in 1942. An old-fashioned gunnery officer, who was reluctant to leave the bridge, Brooke witnessed some less conventional aspects of the service. In early 1944 as squadron gunnery officer in the cruiser Kent on Arctic and Norwegian operations. She had a reindeer mascot, which had been donated by well wishers in the Russian port of Archangel, after it had fouled the decks once too often it was donated to the Edinburgh Zoo. In November 1944 the Royal Navy returned to Southern Norwegian waters from which it had been driven four years earlier for the want of air cover, Brooke planned and executed with textbook precision a night action against a heavily protected German convoy off Egersund. Operating close inshore the cruiser Kent together with another cruiser the Bellona and four British and Canadian destroyers had to maneuver independently to avoid the shallows as they stalked the German convoy of 10 ships under protection of escorts and shore guns. Brooke illuminated the enemy with star shells and coordinated the squadrons fire, switching smoothly from one target to the next. The Germans fought back courageously but five escorts were sunk, two merchant ships were blown up and others driven aground, for the loss of two men killed and three wounded on the Kent, by shell splinters. Brooke was mentioned in dispatches and later awarded the DSC. In July 1945 he was assistant fleet gunnery officer in the King George V, when she was the last British battleship to fire her guns in anger at the bombardment of Hammatsu, Japan. 15 years later he was the last executive officer on the last British battleship the Vanguard. Commander Henry Brooke DSC. Died June 2003 age 89. It is with deep regret that I have to announce the loss of Mr Peter Kelly who once served aboard the Firedrake as the SBA, 'the sick bay attendant' through the ships most trying times. 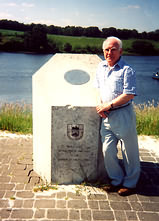 Peter and his wife Breda had attended the memorial reunion in December 2003 at Westminster Abbey and later the wreath laying at the cenotaph in White Hall and the gathering at the U.J.C. in Waterloo, he had made the extraordinary effort to join us travling all the way from Australia after just recovering from a major illness. 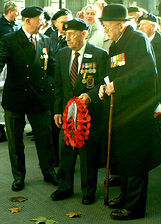 Peter laid a wreath at the cenotaph accompanied with the doctor John Aldren who he had a great affection for, they enjoyed a good long chat afterwards, being apart for so long. Peter had served aboard the Firedrake from the start of the war in 1939 till he was promoted to Petty Officer in December 1941. Destroyers were not permitted to have Petty Officers as sick bay attendants so Peter was drafted and among other things he went ashore with the Marines on D-day June 1944 as a Medic. Peter passed away in hospital on Thursday 6th May I will treasure his memory. When I started my research in September 1999 into what happened to my uncle, Arthur Thomas Grace I had no idea that I was going to meet such a lot of very nice people from all over the world who like me were struggling for answers to what happened to there loved ones on the Firedrake in the December of 1942, it soon became apparent that I would have to form an a association, so in November 1999, I did just that. I now have over two hundred members that have a direct link to the ship, be it like me a lost loved one or a lost friend or relation, and of course those that had served on the Firedrake. 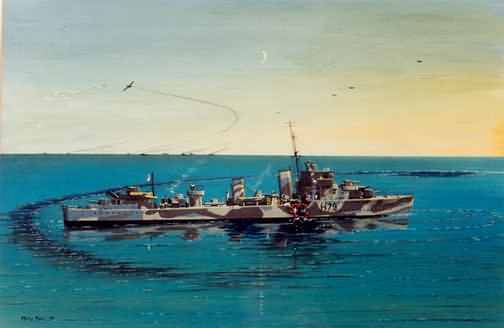 Sitting Duck, A painting by Philip Pain, showing the Firedrake motionless after being damaged by a 500 kilo bomb, while on convoy duty operation "Substance" to Malta July 1941. Photo left Adam and Doris Prügel-Bennett members of the association proudly present their son, Orlando who joined them on the 14th December 2002. The middle photo is Maggie Morgan as pictured in the Daily Mirror in 1943, and page 12 of this web-site. Photo right is Maggie on 30th August 2003 with the same rocking horse 60 years on.